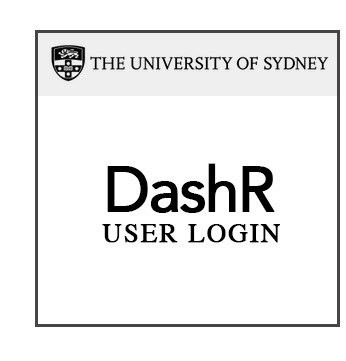 The University of Sydney Researcher Dashboard (DashR) is a centralised location for researchers to register details about their research projects’ data practices and request/manage associated data services. DashR is an improved and streamlined replacement of the RDMP tool. All approved projects, user rights and associated information from the old RDMP tool have been migrated to DashR. Project registration associated with grant funding, contracts and ethics applications is still managed through IRMA. For any questions or help in using DashR, please contact your Research Data Consultants. Effective Research Data Management (RDM) enables researchers to preserve the integrity and continuity of their research. Creating a Research Data Management Plan (RDMP) helps you actively think about research data management and how it applies to your project and aligns your research practice with expectations outlined in University policy. DashR provides a more efficient RDMP process, with a substantial reduction in data entry. Core practices for research data management are captured in a Data Management Declaration that all individuals engaged in research at the University of Sydney must acknowledge. Project planning details and any exceptions to standard practices can then be recorded on a project-by-project basis. When you first login to DashR, you will be prompted to review and agree with the University’s Data Management Declaration. This simple process must be completed before you can access the Research Data Store and Artemis HPC. Please note that this is a one-time acceptance, regardless of the number of projects you might have, and is simply an acknowledgement that you have understood and agree to your obligations and responsibilities when managing your research data. Project planning details and any exceptions to standard practices listed in the declaration can then be recorded on a project-by-project basis. For any project, you can use the “Data Management Planning Details” field to record information about how you plan to manage your data during and after the completion of your project. Where your data is or will be stored e.g. eNotebook, REDCap, Dropbox etc. Details can be as brief or comprehensive as you decide, but please note that this information is meant to provide a foundation for all project members to engage with your chosen practices for managing data in your project. You can use the “Data Management Declarations Exceptions” field to provide details of any of your data practices which are not aligned with standard expectations as encapsulated in your Data Management Declaration. If you require a more detailed RDMP to meet your funder or grant requirements, or as part of Clinical Trials Management Plan, you can complete a RDMP at DMPTool or DMPonline. You can also download and complete this template as a checklist of issues to consider in your project. Any Unikey holder is able to create and submit a project in DashR. However, depending on your role in the project, the approval process for provisioning of requested research data services will differ. Please note that once approved, all listed project members who have agreed to the Research Data Declaration will have read and write access to the requested services. The project’s Lead Investigator (LI) must have an Academic appointment at the University or be a member of the ‘Nominated Lead Investigator’ list. You can apply to have individuals added to the ‘Nominated Lead Investigator’ list by contacting ICT Helpdesk. LIs will appear for selection in the drop-down list as you begin to type their name into the “Lead Investigator” field. As listed LI for a project, you are responsible for ensuring all members of your research group have acknowledged the Data Management Declaration and the project-specific RDMP details. They will not have access to any requested services until they have done this. Any project member may be assigned to an “Administrator” role in the project, and have similar access rights to DashR functions as the LI. The LI is not required to approve any additional changes a project administrator makes to the project after initial project approval, but will be notified by email when changes are made. All HDR students must acknowledge the Data Management Declaration and be listed as part of a project in DashR to satisfy their candidacy. Additionally, they are required to complete the Research Data Management for HDR Students eLearning Modules. If external collaborators need to be listed on the RDMP and/or access the RDS or HPC they will need to have a valid Unikey. To request the creation of a Unikey for an external collaborated, please go to ICT Self Service and navigate to the form: ICT Services › UniKey and account management › UniKey - New Account. The Lead Investigator is responsible for approving a project. A project submitted directly by a Lead Investigator does not need further approval, and the process to provision any requested data services will immediately begin. Any other projects must first be approved by the Lead Investigator before requested data services will be provisioned. All project members will receive an email notification once a project has been successfully submitted and approved. If you requested access to research data services, you will receive emails with details on how to access your requested services from ICT within 1 hour (RDS) or 2 business days (HPC). If you did not request any data services (Artemis HPC, RDS or RCOS) with your submitted project, these can be added at any time and will be provisioned according to the approval process detailed above. If you would like to remove or change the type of service you requested for your project e.g. you no longer require access to Artemis or you no longer require RCOS and would prefer to use RDS, you should contact ICT Helpdesk.